​If you are interested in working with Martin, please use the contact form below and give some details about yourself and your project. Take the A40 heading west towards Llandovery. Once in Llandovery, drive through the town passing the Castle Hotel on the left. The road then bends to the right. Go over the level crossing with the Station on your left. A short distance further on, go over the River Towy Bridge and then take the second turning on the right (Elderly People Crossing sign on the left). Drive up the lane for about 1.5 miles until you come to a crossroads (no through road ahead & yellow sand/grit bin). Turn left. Follow the lane for another 1.5 miles. It is narrow, bendy and hilly. Stay on this lane. Eventually, you will go over a small bridge. Bare left, then round a few more bends and up a hill. You will reach a grey stone farmhouse on your left called "Troedrhiw Esgair". 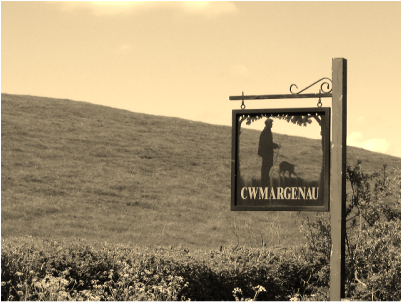 Continue on the lane for another 0.5 mile where you will see an entrance driveway on your left with a signp﻿ost fo﻿r "﻿Cwmargenau﻿". Turn into this driveway and at the end of it, you will find Red Kite Studio. Take the A483 heading south towards Llandovery. When you reach Llandovery, you will come to a "T" junction. Turn right on to the A40. Go over the level crossing with the Station on your left. A short distance further on, go over the River Towy Bridge and then take the second turning on the right (Elderly People Crossing sign on the left). Drive up the lane for about 1.5 miles until you come to a crossroads (no through road ahead & yellow sand/grit bin). Turn left. Follow the lane for another 1.5 miles. It is narrow, bendy and hilly. Stay on this lane. Eventually, you will go over a small bridge. Bare left, then round a few more bends and up a hill. You will reach a grey stone farmhouse on your left called "Troedrhiw Esgair". Continue on the lane for another 0.5 mile where you will see an entrance driveway on your left with a signpost for Cwmargenau. Turn into this driveway and at the end of it, you will find Red Kite Studio.